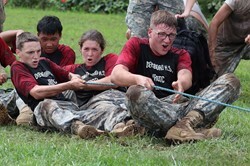 The Allen County-Scottsville High School’s JROTC cadets hosted the annual Patriot Raider Invitational last Saturday. Logan County took top honors in the 14-team event, featuring cadets from nine schools. Five schools entered two teams. Cadets were challenged to complete a series of events which included log sit ups, combat litter rescue, the obstacle course, the hill tire pull, the tire flip, the water can movement, relays, and the one rope bridge. Cadets from AC-SH oversaw each event, recording time to complete and noting any penalties. The cadet units competed as a team against a running clock---with results based on the total time required to finish the entire competition with penalty times factored into the overall time. Logan County completed the challenges in the total time of 87:51. Central Hardin placed second (90:30) followed by Station Camp (93:15). As the host school, AC-S did not compete Saturday. However, the Patriot Raider unit will be in competition this week at the Fairview (TN) Raider Invitational. AC-S will travel to Logan County on September 22. AC-S will also compete in Raider events at Ohio County on October 20 and Graves County on October 27.